A server at a Texas steakhouse got the shock of his life when he picked up the bill receipt for his table, and it’s not because the customer didn’t leave a tip for him. He was stunned by the hateful and racist remark written by the said customer on the receipt. The total amount for the bill was $108.73. 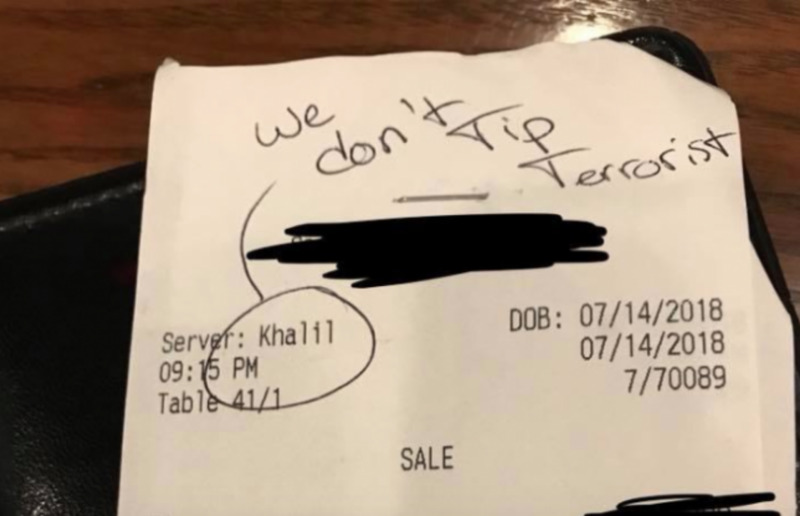 The customer didn’t leave a tip, but instead encircled Khalil Cavil’s name, the server, and had the temerity to write a note that read: “We don’t Tip Terrorist” on the upper corner of the receipt. Cavil shared to the local media that he doesn’t even have any Middle Eastern heritage. His father, who served in the military, named him after a friend and fellow war veteran who was killed in an accident. The restaurant stood by their 20-year-old employee and said they will not tolerate racism. The customer involved will no longer be accommodated in their establishment. Cavil received overwhelming support from those who read his Facebook post. He got thousands of messages of encouragement and support, with some people even going the extra mile and sending tips of their own. Cavil, whose name Khalil means friend in Arabic, says he would rather donate the money people are sending for the missionary work of his church. He emphasizes it is his desire to spread the Gospel of Jesus. Messages on Twitter are also supportive of Cavil while also giving their take that any form of discrimination should be condemned, including attacks on Trump supporters and conservatives. Terrorism is a heinous crime that should naturally get people angry. It should be condemned. But the fury and indignation should be directed to real terrorists who bring destruction to the world, and not innocent beings who only happens to have an Islamic-sounding name. It’s foolish for the customer to make judgment based on a name only. Christians are abused at the same time. Yes, my friend who was a Missionary in Middle East stated that thousands of people were accepting Jesus. Because of his name they assumed he was Middle Eastern. There is good and bad in every one. God bless you and your ministry because God has plans for you. Christians like the one in this story. We have seen Go-Fund me stunts before. We have seen people lie and cry wolf, only to be caught and media suspiciously failing to give 1/10 the attention to the fact they published lies and fake news. Admittedly we (WASP's) have our share of idiots but let us also acknowledge that the Liberal Left are MORE SO, the ones with the long track record of playing the Race Card and generating Fake News and Events. It seems the management has 1 ink pin or did you notice the color size and etc. match the "added" Comment and the scratched out customs name? So I looked up several other fuller pictures of the receipt for greater details. So while it clearly asserts that the customer wrote both, we are placed in a position to accepting their word it happened as stated. We could also be looking at piss poor service, bad food or cooking issues for the lack of a tip that pissed-off the waiter. I encourage others seek a bigger picture and so some googling on COO Terry Turney and /or Landry’s using custom dates 1999-2017. An check for political issues and enlighten themselves to more than article provided details. still and all, it isn't right to call him a terrorist when he is not one. he is a Christian low-key worker, not some radical Islamist.